MMAWeekly Radio is back for Monday’s show with UFC on FX 5’s Jake Ellenberger and his opponent Jay Hieron as well as TUF 16 correspondent Sam Alvey. With UFC on FX 5 just around the corner, opponents Jake Ellenberger and Jay Hieron stop by to talk about their fight as well as the delay that stemmed from their bout being moved from the cancelled UFC 151 card. Also on the show, TUF 16 fighter Sam Alvey remembers his time on the show and recounts how difficult his weight cut was as he prepared for his quarterfinal fight against Joey Rivera. – What new did you learn about Stefan Struve with his performance at UFC on Fuel 5 on Saturday? – Can Stefan Struve be a legitimate contender at heavyweight in the UFC? – Grade the new Dan Hardy‘s performance at UFC on Fuel 5? 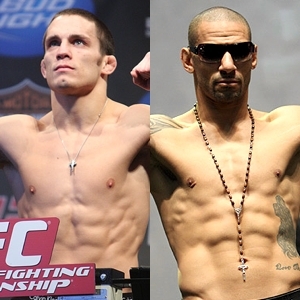 – Most impressive performance at UFC on Fuel 5?